A few months ago Ram Charan was supposed to do a movie director kKoratala Siva. But due to some reasons, the project got cancelled. 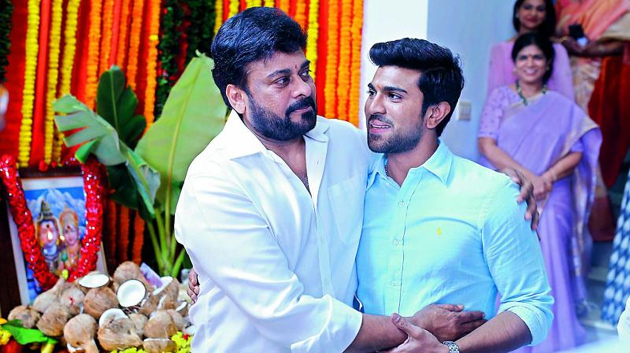 But the Mega Powerstar is now suggesting the director's name to his father Megastar Chiranjeevi. After having a grand come back into the movies with a blockbuster 'Khaidi number 150', Chiru is currently focusing on his upcoming magnum opus 'Sye Raa Narasimha Reddy'. The shooting of the movie is not completed yet but Ram Charan wants Chiru to line up his next projects. Megastar wanted to take things slow and because of the age coming up, it might be too difficult for him to handle so many tasks at a time. But Ram Charan has some different plans. He wants all the star directors to come up with scripts for Megastar. Charan also suggested Chiru hear the scripts from two star directors Boyapati Srinu and Koratala Siva. However mega fans are wondering why Charan is not doing movies with those direct star directors but is suggesting them to his father. Just as Charan wanted Megastar has lined up his upcoming project with Koratala Siva whereas Charan is currently doing a movie 'Vinaya Vidheya Rama' with Boyapati.